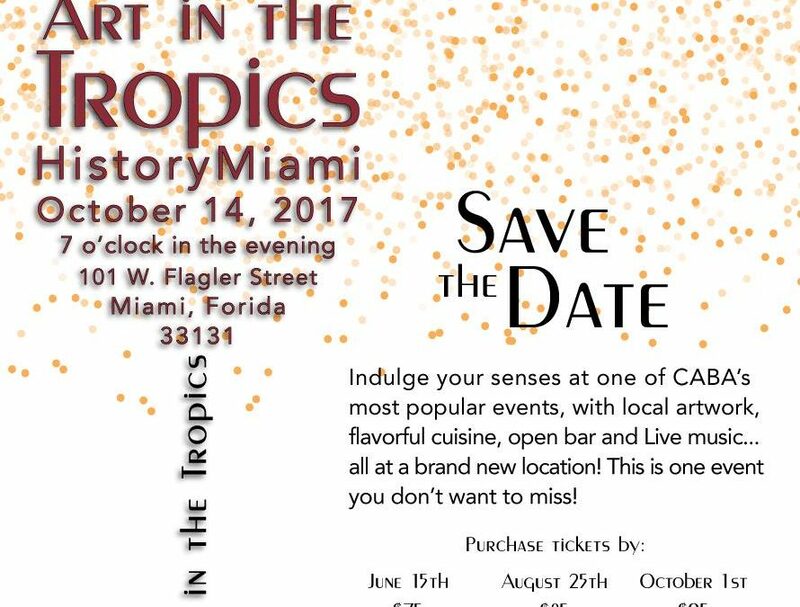 CABA Pro Bono will be hosting its 13th Annual Art in the Tropics fundraiser to benefits their legal advocacy programs and services in Miami-Dade County on October 14th, 2017 at the Historic Miami Museum. Indulge your senses at one of CABA’s most popular events, with local artwork, flavorful cuisine, open bar and live music… all at a brand new location! Fine art influenced by Miami’s tropical landscape will be on exhibit and auctioned off to support CABA Pro Bono and its mission to change the lives of children, individuals and families in need through legal advocacy by providing free legal services to those who cannot otherwise afford it — regardless of race, creed, color, gender, sexual orientation or national origin. CABA Pro Bono makes it easier than ever to attend AIT with two options for Early Bird pricing! Tickets available now for $75 until August 25th! Prices will go up! To register and purchase tickets please visit our event page here.